Equal mix of Bacopa monnieri + Centella asiatica Powdered herbs. Gotu kola is a tonic and rejuvenative for Pitta. At the same time it inhibits Vata, calms the nerves, and helps reduce excessive Kapha. It is perhaps the most spiritual and sattvic of all herbs. Growing commonly in the Himalayas, gotu kola is used by yogis as food for meditation. It awakens the crown chakra and helps balance the right and left hemispheres of the brain. A cup of gotukola tea can be taken with honey before meditation. As a milk decoction gotu kola makes a good nerve tonic. The powder may be used externally as a paste for chronic skin conditions. With basil and black pepper, it is good for fever. BRAHMI as it aids knowledge of Brahman, the Supreme Reality is perhaps the most important nervine herb used in Ayurvedic medicine. It revitalizes the brain cells, removing toxins and blockages within the nervous system, while at the same time having an nurturing effect. It improves memory and aids in concentration. A small amount of the fresh leaves are eaten daily for rejuvenating the mind. Brahmi helps awaken the crown chakra and balance the right and left hemispheres of the brain. It calms the heart and helps guard against heart attacks. Brahmi Churna (bacopa monnieri) is ground leaves from the bacopa plant. It is used both internally and externally. Externally, it can be applied as a paste or in oil to relieve the pain and swelling of the joints due to injury or arthritis. Internally, it is one of the best tonics for the nerves and is widely used in Ayurvedic treatments epilepsy and hysteria. Due to its inherent strength it can be very toxic at high doses, and so is generally steeped in water as with tea as opposed to a decoction in which the herb is boiled in water for some time. This mild infusion can be very bitter and it is recommended to be taken with honey. In this form, bacopa delivers all the effects for which it is famous. It improves the memory and intelligence, soothes the nerves, relieves headaches, cools the body, relieving burning and pain, and is even slightly diuretic, helping to cleanse the kidneys and blood of toxins and excess salts. Brahmi Churna (Centella asiatica / gotu kola) is the ground leaves from the gotu kola plant. It is also used both internally and externally, but has slightly different effects. Gotu kola is a tonic and rejuvenative for Pitta, and used externally it helps to relieve burning and itching in chronic skin conditions. Internally, its blood purifying effect helps to alleviate a wide range of skin conditions from the very serious like leprosy and syphilis to the less serious like eczema and psoriasis. For such conditions, combined internal and external application can augment these effects. Gotu kola taken in a mild infusion or as a tea is also soothing to the nerves, supportive of cognitive function, and an aid against aging and memory loss. It further supports the immune system and the adrenal glands by both feeding and cleansing them. Taken in as a decoction in milk it is especially soothing to the nerves, and can be a great tonic for anxiety, nervousness, and headache. The Hindi meaning Gopala is ‘The Nurturer of the Cow’. The cow is an auspicious blessing from Mother Earth for the good of all humankind. They who care for the blessings which our Mother has given us, care for the Mother herself. It is through this care that the bountiful provision which is our inheritance is enjoyed, preserved and multiplied for ourselves, our children and generations to come. This is our deepest desire and purpose: that all humanity may have life and have it more fully. Our name in every way reflects this desire and the means by which we propose to pursue it. It is for this reason that we use only 100% organically grown, harvested, and processed herbs in our products, support sustainable economics, and endeavor to continue the millennia old tradition of natural and holistic science. The roots of Gopala Ayurveda reach deep into the rich and ancient naturopathic tradition of Ayurveda. Utilizing the wisdom of this four thousand year old science with the technological potential of modern science we render these ancient formulations in a potent form, all the while maintaining faithful adherence to the formulae and therapies of the ancient texts. To this end, we have spearheaded research to develop Ayurveda’s vast herbal tradition into a comprehensive range of products to support healthiest and longest lives for our customers. These products have been met with warm reception in medical communities all over the world, and continue to serve the personal and healthcare needs of all parts of humanity. 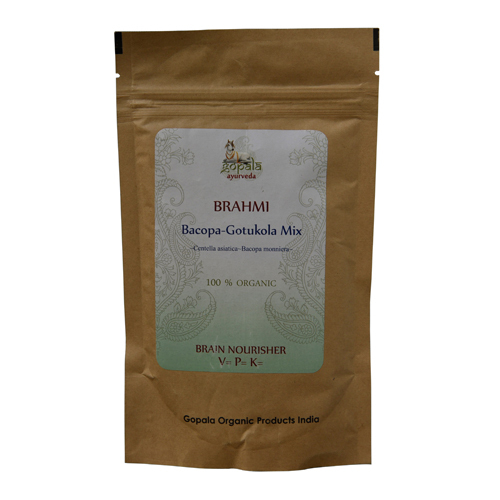 Gopala is a pioneer in purely organic ayurvedic supplements, herbs, and oils. We promote healthy foods and nutritional products, and despite utilizing the benefits of modern science and technology, we train a strict eye on all stages of development and processing to be sure that our products do not suffer contact with any toxic or synthetic chemicals. Since the birth of this project, we have focused on the development of safe and effective remedies that will help people lead richer and healthier lives. Gopala is not simply organic, which means to be free from any chemicals, pesticides, synthetic fertilizers, artificial additives, preservatives, and heavy metals, but we are 100% Certified Organic, meaning that the customer has the added security of the USDA regulatory action which requires that all ingredients in all products be traceable through their processing history and to the place of origin. Consequently, the consumer may know both exactly where and when each herb came from and the circumstances surrounding this journey to their hands. Gopala is unique in this regard. Other manufacturers, having claimed proprietary rights to ancient formulae have taken the liberties of enhancing these revered concoctions with preservatives, synthetic substitutes, and more. We, however, continue this venerable tradition as it has been maintained for thousands of years, in the sole interest of a whole and healthy life. We at Gopala Ayurveda invite you to browse our website’s many products and informative articles and Allow us to serve you and your community with the bounty of Mother Nature!